I have always made sure my daughters are an integral part of the upkeep of our home, partly because I want them to develop an appropriate work ethic, a sense of responsibility, and learn how to clean and take care of stuff, and partly because I just can't do it all myself! I've often found people are surprised when they hear how much the girls are able to do around the house, so today I wanted to share the list of "chores" they currently do. 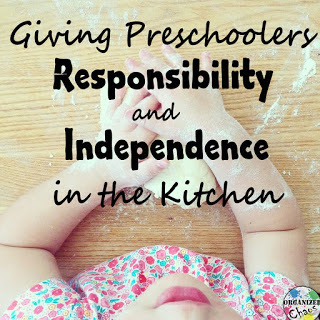 Basically for now this just involves getting their lunchbox out of the fridge and packing it in the morning, and taking it out and bringing it to the sink for me to wash after school. 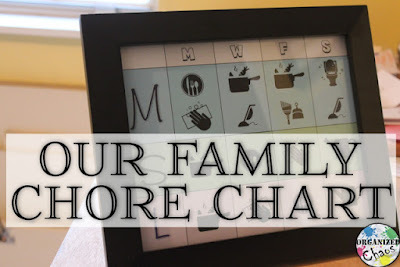 These jobs are a part of the chore chart rotation, so each of us sets and clears the table once a week (read more in the post linked above). Setting the table involves getting out dishes, napkins, silverware, and condiments etc, and clearing the table means putting the dishes in the dishwasher or sink and putting away extra silverware or condiments, then wiping the table. As I already mentioned, the load the dishwasher as part of clearing the table, but they also help me unload the dishwasher once everything is clean. A lot of the dishes are stored in cabinets that are too high for them to reach, but they can take them out of the dishwasher and set them on the counter, and they can put away all of our silverware, mixing bowls, and other dishes. Every now and then, probably about once a week, the girls help sweep the floor (especially under the dining table) with a brush and dust pan. They obviously can't carry the huge trash bags but they help me carry out smaller bags of trash or items to recycle to the larger garbage/recycling bins outside. If they spill a little milk or something, I usually have them wipe it up with a rag themselves. This is their favorite thing right now and they often fight over whose turn it is to get the mail! Unfortunately our condo complex recently switched over to locked mailboxes and our mailbox is now up a little too high for them to reach, so now I have to go with them and they carry the mail back to the house. 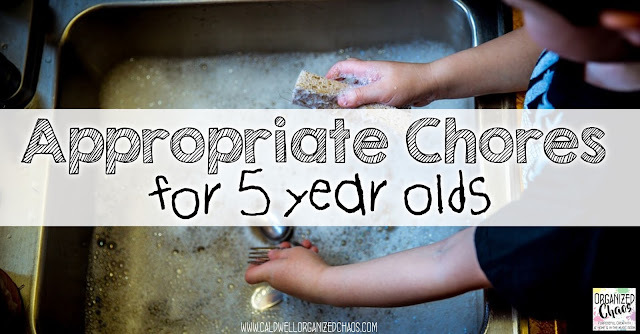 What other chores do your young kids do around the house? 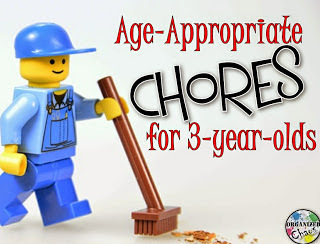 What is your opinion on how much kids should be expected to do around the house, and whether they should earn rewards or allowance for doing them? I am starting to think about if and when to start giving them an allowance, so I'd love to hear your thoughts- I know there is a wide range of opinions on these topics! 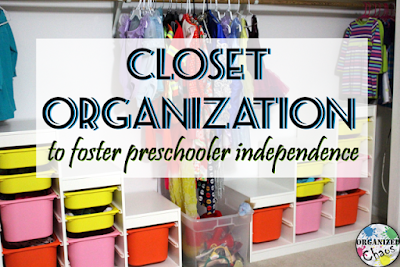 Click here to sign up for the Organized Chaos newsletter and get more ideas for home and school sent straight to your inbox!